Milan (AFP) - Italian Moto2 rider Romano Fenati on Monday apologised for his "impulsive" behaviour after being sacked by his Marinelli Snipers Team for grabbing rival Stefano Manzi's brake while riding at a speed of over 200kph during the San Marino motorcycling Grand Prix. The 22-year-old -- who has also been banned for two Grand Prix and could face criminal proceedings -- apologised for his "disgraceful gesture". Both riders were speeding around the Misano track on Sunday when Fenati -- aboard a Marinelli Snipers-run Kalex bike -- leaned over and pressed Manzi's brake lever. Manzi briefly lost his balance before regaining control of his Suter bike. "I apologise to the world of sport. This morning, with a lucid mind, I wish it had just been a bad dream," Fenati said in a statement. "I made a disgraceful gesture, I was not a man! A man would have finished the race and then he would have gone to race direction to try and get some justice for the preceding incident. "I shouldn't have reacted to provocation," continued Fenati. "A horrible image of me and of the sport has come out. I'm not like that, people who know me well know that! "In my career, I've always been a fair rider. Last year I was one of the few who was not penalised, I have never put someone else's life in jeopardy, on the contrary, I have always maintained that there are riders on the track who are dangerous because of their riding style." He added: "It's true, unfortunately I have an impulsive character, but my intention was certainly not to hurt a rider like me, rather I wanted to make him understand that what he was doing was dangerous and how I could also have done something similar to what he did to me! "I just want to apologise to everyone. Now I will have time to reflect and clear my head." Fenati's team had early confirmed they were severing his contract "for his unsporting, dangerous and damaging conduct for the image of all". "With extreme regret, we have to note that his irresponsible act endangered the life of another rider and can't be apologised for in any way," the team said. "The rider, from this moment, will not participate in any more races with the Marinelli Snipers team." Fenati also lost his ride next season with he has lost his ride at Forward Racing, which will run in partnership with Italian manufacturer MV Agusta. "Our sport is already extremely dangerous, and any act which increases the risks involved for the riders is intolerable," Forward Racing owner Giovanni Cuzari said. "We cannot accept behaviour of this type from one of our future riders." Giovanni Castiglioni, president of MV Agusta, said: "In all my years of watching sport, I have never seen behaviour as dangerous as this. A rider who can act like this can never represent the values of our company, and our brand." Fenati also made headlines for kicking out at Finnish rider Niklas Ajo during the Moto3 warm-up at the 2015 Argentinian Grand Prix. He was dropped for disciplinary reasons during the 2016 season by the Sky Racing Team VR46, owned by Italian motorcycling star Valentino Rossi. 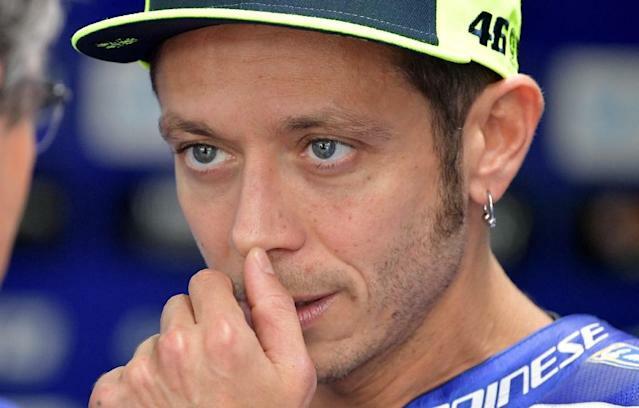 "I'm sorry," said Rossi. "We had focused a lot on Romano, but we couldn't handle him. It ended in failure." Manzi was also penalised and will start six places back on the grid for the next Grand Prix in Aragon, Spain on September 23. "I don't know how I managed to stay up," said Manzi. "It's difficult to forgive a gesture like that, where an opponent tries to kill a rival at over 200km per hour." Fenati was 19th in the Moto2 standings with 14 points.